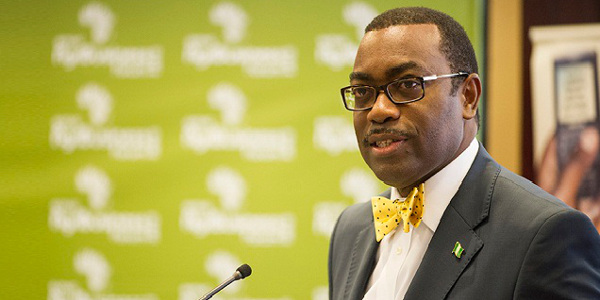 President of the African Development Bank (AfDB), Akinwumi Adesina, is championing the transformation of the rural economies of African countries as the fastest way to lift millions of people out of poverty. The President, who is on a three-day visit to Ghana, 1-4 August, spoke at a welcome dinner hosted by Ghana’s Minister of Finance. The dinner was attended by the Vice President of Ghana, Mahamudu Bawumia, Governor of the Central Bank of Ghana, and key government functionaries. “To do that, we have to make sure that agriculture, which is their basic source of livelihood, is made a business, not a way of life. I don’t believe that agriculture is a way of life at all. It is a development activity. This is where Africa’s wealth will come from if we do it the right way. Agro industrialization has to play a very big role in what we do. Adesina, who spoke on various ways the Bank will continue to support Ghana, emphasized that the country has no business importing rice and pledged the AfDB’s support in this area. “One of our High 5s is to Feed Africa. Coming from the airport, I was speaking to the Honourable Minister of Finance about northern Ghana, and I was saying that northern Ghana has over 400,000 hectares of land which is very good for agriculture. Ghana absolutely has no business at all importing rice. You are spending US$400 million a year importing what you should be exporting. I think we are going to do something about that. It is one of the key issues that we are going to be discussing,” Adesina said. The AfDB President also spoke about the Bank’s plans to support Ghana and Côte d’Ivoire to transform the cocoa industry and create more wealth and jobs from the product. “You are trying with 40% of cocoa production, but you can do more. The Bank will support you and Côte d’Ivoire with how you can coordinate your production and also your market support to avoid the fluctuations that you currently see. I have a firm belief that God has given every nation what they need to develop and to strive. The issue is what you do with it. We have a programme that we are going to be discussing with you,” the President emphasized. Thanking the Ghanaian government for making the visit possible, Adesina stressed how the country had made steady progress since the Presidential election in January this year. The Bank will also contribute to the stabilization of the energy sector. He stressed why the continent needs to give youth the tools and the means to stay in Africa and to prosper by doing so. Last year, the African Development Bank and the European Investment Bank launched Boost Africa, an initiative that provides support to the earliest and riskiest stage of the entrepreneurial value chain via a funding mechanism that will channel €150 million to 2,000 young entrepreneurs, and create 75,000 direct jobs and 500,000 indirect jobs. “As I begin to see Africa turn from a continent that used to call loud and long for development grants and aid to a continent that now draws up well argued dossiers for hard-nosed entrepreneurs and investors, I am proud to be called Africa’s Optimist in Chief. I reject pessimism because I don’t think it makes sense. It also fails to take account of the future because it walks into it backwards. Vice President of Ghana, Mahamudu Bawumia lauded Adesina for his focus on agriculture and pledged his government’s support. “It is clear that the AfDB is going places with you as President. We can see and feel it. For any economy in Africa to change, we need to solve the agriculture problem. This will put us on the way to industrialize. Our next budget as a country will focus on agriculture. We are counting on the Bank to be with us on this journey, as you have always been,” Bawumia said. Also speaking, Ghana’s Minister of Finance, Ken Ofori Atta, commended AfDB’s work in Ghana and expressed optimism that the partnership would be strengthened with Adesina’s visit. “As a country, we believe that we need to get back to basics and the beauty of Adesina’s Presidency is this clarity on agriculture and the need for us to have food security, and more importantly, power and the whole concept of industrialization. And it is exciting to have someone who has had quite a lot of experience and success in Nigeria as Agriculture Minister at this time when we most need it,” he said. “There are a lot loan facilities that we are working on, and there are already good projects in energy, agriculture, rural roads and others. For all of us, between energy and agriculture we should be able to strike a partnership. He also commended the Bank for stepping in to ensure that Ghana and Côte d’Ivoire work together to change the cocoa narrative.